Is the Sabbath Day a commandment for believers today? Or, has the shadow given way to the reality? The Sabbath Day|Commandment or Fulfilled? A while back I received an email from one of our visitors and viewers of my YouTube videos. He posed some questions about the passing of the Law of Moses as well as the Sabbath Day issue. I am sharing a bit of that exchange with our visitors, since the Sabbath Day is actually a vital eschatological doctrine, and yet, in my opinion, is sorely misunderstood. And thank you for that referral to “The End of the Law…” I will check that out. I’m currently reading “We Shall Meet Him in the Air” and I have “The Elements Shall Meet…” on deck. I’m also reading the Parousia by Russel and this week I just received “The Cross and Parousia” by M. King this week in the mail…so I have a lot of reading to do over the holiday. I appreciate your teachings and I have a question concerning Romans 7 that I need to word properly; if you have time to respond, I’d be grateful and if not, I’d understand as well. I started learning about Covenant Eschatology back in 2013 and adamantly rejected it. At the time I considered myself a partial preterist. I always found it funny that the “orthodox” world said that you can be Post, Pre, or A but you cannot be “full preterist”… but the funny thing about that, is that the majority of believers do not even know their own eschatological positions or think 2 thoughts about it! It’s like saying, you can choose a, b, c and know NOTHING about it, but you certainly cannot have some informed learning and decision making and choose “d”. The spirit of tradition is a hard task master…I know from my journeys. From 1 coffee lover to another… God bless and have a good rest of the week. On January 12, 2016 I received another post in regard to the Sabbath Day issue. You and I corresponded a bit back in late Nov / early Dec. If I may trouble you to point me in a direction; I just listened to a “2 Guys and a Bible” episode from 10 months back, with Mr. Bell concerning the Sabbath Day. I was hoping you’d touch on the Creation aspect of the Sabbath. The interpretation of which I’m accustomed to, which is pretty much Westminster Confessional Theology, is the Sabbath was not only a Mosaic ordinance but was instituted in the Garden. Therefore it had Mosaic ordinances or positive commands annexed to it, but that was only during the “school age when God’s people needed a school master”. But it is valid as a command of God’s moral law. Wasn’t only given for a shadow but instituted from Creation. Can you point me to any article or provide a short blurb on why it is only Mosaic if it was given in creation? If you are unable to respond; I understand. I’m still finishing “We Shall Meet Him in the Air” and I’ve got the “Elements will Melt” on deck. You already recommended to me from Torah to Telios, but as I’m struggling with my own observance of the Lord’s Day (is it a Sabbath), I’m hoping you can help. Most of what you pointed out concerning the Sabbath from that podcast episode, I’m seeing and it seems relevant from Scripture, but for many Reformed background persons like myself, it was missing the creation commentary if I may say so. … , it is good to hear from you again! Let me put a couple of things below in the appropriate places, in regard to the Sabbath. This is a very special issue with me. I am working on a book MSS (currently over 300 pages) on the issue, and hopefully, what I will be offering will be helpful to the entire believing community. I have, in my early years, interacted with Sabbatarians extensively and those studies forced me to look at the issue carefully. See below! 1. Genesis 2:7 says “God blessed the Sabbath, and sanctified it, because in it He had rested.” The wording must be carefully noted. It says God sanctified the Sabbath, but, it does not tell us when He sanctified it! The writer’s temporal standing must be honored. He was writing long after the Creation, looking back on it. If the writer is Moses, then he was writing during the time after the Lord had sanctified Sabbath as an institution, at Sinai! Now, it is pretty clear to me that the Israel’s knew something of the Sabbath prior to Sinai – Exodus 16- but, we have insufficient evidence to demonstrate any kind of codification prior to that. 2. There is no question that YHVH gave Israel the Sabbath, as a sign and reminder of Creation (Exodus 31). Sabbath was a covenant sign between God and Israel of the Creation! This raises all sorts of issues that the Sabbatarian world– or the wider Christian world, has not addressed properly, or so it seems to me. If the Sabbath was a covenant sign between YHVH and Israel– as it undeniably was per Exodus 31 – how could it be true that the Sabbath was for all men i.e., created in Genesis 2 as a universal command? A sign sets something apart as distinctive, exclusive, etc.. But, to reiterate, if the Sabbath was created in Genesis as a universal mandate– as Reformers claim– (for instance Greg Beale takes this position)– then how could it be said that the Sabbath was a covenant sign between God and Israel?? This is hugely problematic. The Sabbath– “as a Mosaic Institution” – foreshadowed the final salvation, resurrection, the New Creation, per the Rabbis and virtually every known scholar. This is essentially indisputable. Jesus said that not one jot or one tittle of “the Law”– which included the Sabbath mandate – could pass until it was fulfilled. Thus, the Sabbath, as an institution, not just its Mosaic appurtenances, but, the typological Sabbath, could not pass until what it foreshadowed came to a reality– that is until the resurrection! Now, there is not one word in Scripture to justify the idea that the seventh day Sabbath– the typological Sabbath — has somehow been altered into the “Christian Sabbath.” That is a theological invention with no merit. (This truth is fatal to the Reformed view of the Sabbath). Jesus did not say that the Mosaic institutions of Sabbath would pass, being changed into Sunday observance. The “Sabbath”– from Creation– was the seventh day! So, when Reformers claim that the Sabbath day has been altered, they are thereby falsifying their own doctrine! Sabbath is the seventh day, not the first day, so if Sabbath is an eternal command– after the removal of the “Mosaic institutions” — then of necessity, it is the Seventh day that must be observed! Moses is not the one that designated the Seventh Day! So, you can get rid of the Mosaic institutions (again, this is Biblically inaccurate anyway) if you like. But, the designation of the Seventh day– and the prohibition against working– were given by YHVH. They were not “Mosaic institutions” that can be divorced from their origin in YHVH. So, Reformers are in clear violation of Jesus in Matthew 5. They change the original (not the Mosaic) designation of the Sabbath. The fact is that if the Lord has not come, and if the New Creation (the ultimate Sabbath) has not come, then every believer should keep the (Seventh Day!) Sabbath Day. Again, the Sabbath Day was a sign of the final salvation, the New Creation, resurrection! Paul said the Sabbaths were a shadow of those things, but, he also said that the “better things” foreshadowed by the Sabbaths (and the Seventh Day Sabbath was the first of the Sabbaths– Levititucs 23) were “about to come.” (See Colossians 2:14f) and, he said that at the time he wrote ‘There remains a Sabbath rest for the children of God.” But, he was standing on the cusp of the realization of the types and shadows of the Sabbath Day! The eternal rest was about to come, for they were about to receive the New Jerusalem– it was “about to come” (Hebrews 13:14). Note that in Revelation 14:13f, the angel said “Blessed are those who die in the Lord from now on, for yes, says the Spirit, they shall rest from their labors!” The word “rest” used here is anapausis, one of the standard OT words for the Sabbath rest! So, Revelation shows that the Sabbath rest was about to be given – at the coming of the Lord – that was very, very imminent! Sabbath was about to be fulfilled! Hope this helps just a bit. This is a vast and fascinating issue, and a critical eschatological doctrine that is almost ignored by many. I am very hopeful that when my book comes out– Lord willing next year – that it will be a blessing to believers. The issue of the (true) “Sabbath Day” is so very important! 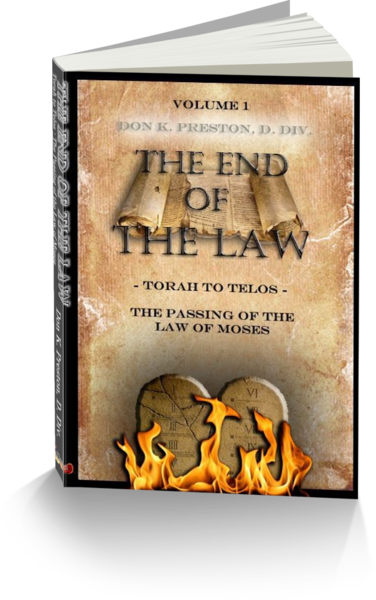 For some very good discussion of the Sabbath Day, get a copy of my book, Torah To Telos, the Passing of the Law of Moses . It will serve as an excellent “primer” for understanding the eschatogical significance of the Sabbath Day. Torah to Telos– An excellent discussion of the Sabbath Day.